When the presidential candidates square off and debate in this campaign, I hope they don’t think Asian Americans are such “success stories” they can simply write us off when it comes to public policy. You never know. They may have read The New York Times. 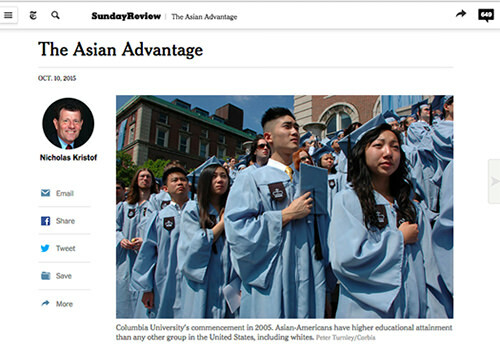 If you’re still buzzing about Nicholas Kristof’s “The Asian Advantage” in Sunday’s New York Times, I don’t blame you. Talk about a major infusion of positive stereotype re-enforcement! We didn’t need it. And, of course, it’s wrong. It’s Kristof, a Tiger Dad by marriage, letting us know his stripes–about how he feels about us Asian Americans. Maybe it’s because he knows that despite the Census data for income and educational attainment (We’re No.1), it’s unwise to use such a broad brush when it comes to generalizing about Asian American success. Income is often misleading due to the large numbers of earners in an Asian American household. It’s even more misleading when you break down the numbers by ethnicity. Disaggregate the dozens of Asian ethnicities in the U.S. and the poverty rates are astonishingly high for Southeast Asians (Hmong Americans, 37.8 percent; Cambodian Americans, 29.3 percent; and Laotian Americans, 18.5 percent). If poverty is success (as I suppose it might be for, say, a priest or monk), then I guess those numbers are consistent with the assumptions of Kristof’s basic question. If Asian Americans have discovered the secret to the end of discrimination, that would be right up there with driving in the historic Golden Spike! It’s a ridiculously offensive line, laced with that old-fashioned model minority mindset. But that’s what Kristof’s “Asian Advantage” is about–an attempt to lend credence to a tired iconic stereotype. Here’s what Asian Americans really know to this day: Not all Asian Americans are successful, and even successful Asian Americans know discrimination isn’t over. Ask the Harvard grad who can’t a job in his field. The bamboo curtain bends but doesn’t break. That’s the ironic thing about the new scholarly work Kristof cites in his column. “The Asian American Achievement Paradox,” by sociologists Jennifer Lee and Min Zhou, was intended to be an antidote to the hard cultural stands that commentators like Kristof on both the left and the right are fond of taking to explain Asian American success. A little nuance is better, right? That, folks, is what we non-academics would call modern, everyday racism. 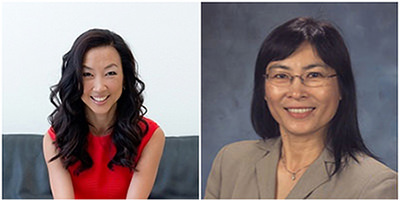 Lee and Zhou’s research is based on 82 in-depth interviews with Chinese and Vietnamese immigrants in Los Angeles. And though Kristof cites the book, he does it a tad selectively. Far from stories of Asian success, the authors found some interviewees who had not graduated from college or “languished” until they ultimately graduated beyond four years. Some just dropped out. Behind the success stories are these real stories that form a new invisible Asian American–the kind that most want to deny really exist. “Their stories, while not atypical, go unnoticed and unremarked upon by their immigrant parents, other immigrant children, their ethnic communities, the American mainstream media, and even social scientists,” Lee and Zhou write. That nuance of Lee and Zhou’s work is lost from reading Kristof’s column. So how did Asian American achievers become successful? Lee and Zhou say much of it is due to the kind of immigrants who have come here since the Immigration and Naturalization Act of 1965. When the racist quotas of the past were finally lifted, the people who came weren’t your typical early immigrants. Post-65s were all self-selected, prone to education and new world success. And when they sought opportunity in the U.S., Lee and Zhou say they used the social capital in their community networks to succeed. That’s it. That’s the real Asian advantage. The social capital and being around other Asians explain our success, not comparing ourselves to non-Asians. That may explain why refugee communities in far-flung places in the Midwest may not do as well as other Asian groups. Read that passage in Lee and Zhou’s book and you realize the questions posed in Kristof’s piece are just a phony pose. Yeah, that’s part of it. But sometimes hard work doesn’t produce success. Only more sweat and often frustration. Funny, I don’t see anyone who knows how hard it is to be Asian American–especially in non-traditional fields for Asian Americans like the media, the arts, or politics–patting himself on the back thinking discrimination is finis. No, for that, it takes the positive action that has always changed society: public policy and legislative changes, such as the lifting of racist immigration quotas, the ending of anti-miscegenation laws, and the repeal of laws forbidding property ownership. And yes, the preservation of affirmative action to provide diversity in schools and the workplace. That’s where the hard work still remains to be done and the reason it’s important to hear someone in the upcoming campaign address Asian Americans as more than a stereotype. But we won’t get what we all need if people buy into the views of the Tiger Moms and Dads blinded by their own success.